Climate change an 'imminent' security threat: risk experts - SABC News - Breaking news, special reports, world, business, sport coverage of all South African current events. Africa's news leader. 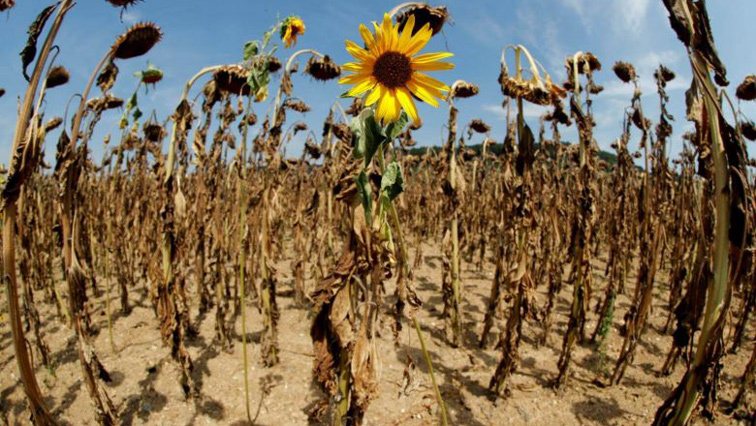 A sunflower blooms in between dried-out ones during hot summer weather on a field near the village of Benken, Switzerland, on Aug 6, 2018. Climate change threats, from worsening water shortages in Iraq and Pakistan to harsher hurricanes in the Caribbean, are a growing security risk and require concerted action to ensure they don’t spark new violence, security experts warned on Tuesday. Iraq, meanwhile, has seen its water supplies plunge as its upstream neighbours build dams and climate change brings hotter and dryer conditions to Baghdad, said Hisham Al-Alawi, Iraq’s ambassador to the Netherlands. “Overall we are getting less by nearly 40% of the waters we used to get,” he told the conference. Shoring up the country’s water security, largely by building more storage and cutting water losses, will take nearly $80 billion through 2035, he said. Faced with more heat and less rain, “we need to be wise and start planning for the future, as this trend is likely to continue,” he said. The threat of worsening violence related to climate change also extends to countries and regions not currently thought of as insecurity hot spots, climate and security analysts at the conference warned. About 90% of the region’s economic activity particularly tourism, fishing and port operations takes place on the threatened coastline, he said. Hurricanes, in recent years, have flattened the economies of some Caribbean nations, with Hurricane Maria in 2017 costing Dominica about 225% of its GDP, according to World Bank estimates. But as the global emissions that drive climate change continue to rise, “there’s not a realistic chance of achieving the goals of the Paris Agreement”, Hart suggested. The agreement calls for a rapid shift away from fossil fuels to hold the global average temperature rise to well below 2 degrees Celsius. The failure to cut emissions means the Caribbean, while doing what it can to become more resilient to the growing risks, also needs “to plan for the worst-case scenario”, Hart said. It is trying to do that by building coordination and assistance networks among Caribbean states and looking to shore up access to food and water, among other changes, said Ronald Jackson, of the Caribbean Disaster Emergency Management Agency. Often that work requires persuading officials from very different ministries – finance, tourism, agriculture, water,energy and security, for instance – to sit down together and coordinate plans, said Jackson, the group’s executive director. And the work has to be done quickly, he said. Last October the world’s climate scientists warned that to hold global temperature hikes to 1.5 degrees C, global energy systems would have to dramatically shift in the next dozen years. This entry was posted on 20 Feb 2019,09:35AM at 9:35 AM and is filed under Sci-tech, Homepage Featured Story Slider. You can follow any responses to this entry through the RSS 2.0 feed. Both comments and pings are currently closed.